Pune 01 Sept ( UNI) : The Ministry of Defense today promoted Lieutenant General Bipin Rawat and appointed him to Vice Chief of Army Staff Delhi, Lieutenant General PM Hariz, AVSM, SM, VSM took over as General Officer Commanding in Chief Southern Command on today. Lieutenant General Bipin Rawat who has proceeded to Delhi to assume duties of VCOAS. 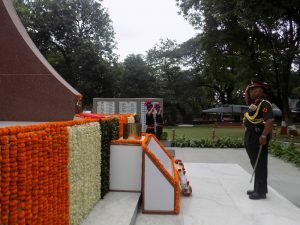 On assuming command of the largest geographical formation of the Indian Army, the General laid a wreath at the National War Memorial Pune and paid homage to the martyrs. Thereafter the General was given a Guard of Honour. The current assignment of the General Officer is a testimony of his continued dedication to service, which began on his commissioning in June 1978. Prior to the current appointment, he was General Officer Commanding-in-Chief Army Training Command at Shimla. Lieutenant General PM Hariz hails from Kozhikode in Kerala, and did his schooling from Sainik School, Amravatinagar (Tamil Nadu). The thoroughbred soldier is an alumnus of the National Defense Academy, Pune, on completion of basic military training from Indian Military Academy at Dehradun in 1978, he was commissioned in to 12 Mechanized Infantry Battalion and later commanded 19 Mechanized Infantry Battalion (Recce and Support) (Tracked), he has attended all mandatory Army courses, the prestigious Staff Course at Camberly (UK), Higher Command Course at Mhow and National Defense College at Delhi. PM Hariz has vast experience of serving on prestigious staff and command appointments, he has the unique distinction of holding various UN appointments, which include a combined tenure as Military Observer, Chief Personnel Officer and Regional Commander in Angola, he was instructor at Infantry School, Mhow and also at the prestigious Defense Services Staff College, Wellington, beside this he has commanded a Battalion, Brigade, Division and Corps in the Western Sector. The General Officer has also commanded an operational Sub Area and has been on staff appointments at various levels a t the Integrated Headquarters (Army) at Delhi. He is a recipient of Ati Vishisht Seva Medal, Sena Medal and Vishisht Seva Medal. Lt Gen PM Hariz, AVSM, SM, VSM General Officer Commanding-in-Chief Southern Command paying homage to martyr at National War memorial.